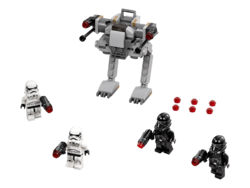 75165 Imperial Trooper Battle Pack is a Star Wars Rogue One set released in December 2016. Boost your LEGO® Star Wars™ collection with the Imperial Trooper Battle Pack. This set features an Imperial walker with space on top for a minifigure, posable legs, two laser cannons and elevating stud shooters and a stud blaster storage clip, plus four minifigures each armed with a stud blaster. Includes four minifigures: two Imperial Death Troopers and two Stormtroopers. Features a walker with posable legs, two laser cannons and elevating stud shooters, a stud blaster storage clip and space on top for a minifigure. Jump on the walker, arm your weapons and get ready to move out! Weapons include four stud blasters and extra ammo. Play out action-packed scenes from the blockbuster movie Star Wars:Rogue One. Combine with the 75164 Rebel Trooper Battle Pack for great Star Wars: Rogue One adventures. Walker measures over 3” (10cm) high, 3” (8cm) long and 3” (8cm) wide. 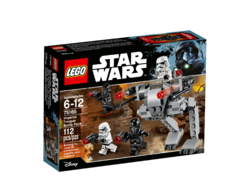 Facts about "75165 Imperial Trooper Battle Pack"
This page was last edited on 9 February 2019, at 22:05.